Soooo, my mother-in-law (who is visiting for a few weeks) miscalculated a step and stumbled down our staircase this morning. Fortunately, Martin and I were nearby, and got to her quickly. It was obvious her ankle was in bad shape. I volunteered to fireman-carry her out to the car, but of course, we called the medics instead. 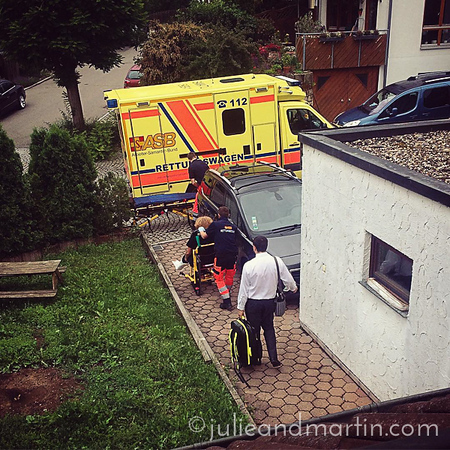 Two strapping young men arrived, bandaged her up, and wheeled her out as the neighbors watched.